Wimpy's is Sarasota's Full Service Plumber! Home / Drain and Sewer / Wimpy’s is Sarasota’s Full Service Plumber! 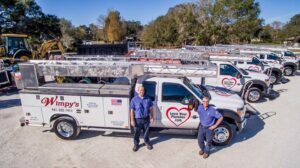 Wimpy’s is Sarasota’s Full Service Plumber! When you want a Plumber, wouldn’t you rather have one that can take care of all of your plumbing needs? Wimpy’s is that Plumber, Sarasota’s Full Service Plumber! We can fix your running toilet, drippy faucet or install all new drain lines and water lines in your house. We can clear your drains that are stopped up or install you a whole house water conditioner, filter or water softner. If you are having a problem stoppage, we have the latest technology to go inside a drain line with a camera and see what the problem is. If fixing the problem would involve cutting up your floors, we have the proper equipment to minimize the damage to your home. We specialize in keeping your home clean while major work is being done. We have the tools and technology to split your old drain line and pull a new pipe through the existing line without disturbing your floors. This technique is called pipe bursting or trenchless technology. Should we have to cut concrete we can use our Dustless Technology System to eliminate the concrete dust and concrete mud that would typically be in your home if one cuts concrete. We have a link on our website that will show this amazing tool in action, inside of a Men’s Wearhouse, when we were cutting concrete right next to the black tuxedo’s. Seeing is believing! Oh, did I mention how refreshing it is to schedule an appointment? When you call Wimpy’s office for us to come fix any plumbing problem you may have, rest assured that you will never hear a more friendly voice than our office manager, Lori. When you need a Plumber, do you really want some company to send you someone who only knows how to change a water heater? Do you want them to arrive and then leave to get parts they should of had? Wouldn’t you rather they arrive on time, be knowledgeable and fix your problem right then and there? Wimpy’s does just that. We own Super Trucks. Clean, fully stocked, organized and ready to tackle any plumbing problem you may have. Find out why people say I Love My Plumber!